Ex-Arsenal star Lauren has urged his former club to take advantage of a potential Anthony Martial exit from Man Utd given his contract issues. The 22-year-old has hit a good run of form in recent weeks, scoring six goals in his last seven Premier League appearances, taking his tally to seven in 16 outings. 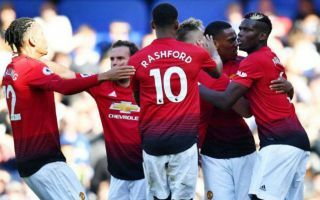 It’s a reminder of the quality that he possesses, but having not always managed to secure regular first-team football under Jose Mourinho, coupled with the uncertainty over his future at Old Trafford due to his expiring contract, question marks have been raised. Martial will see his current contract expire at the end of the season, and in the event that Man Utd aren’t able to reach an agreement on new terms, Lauren believes that Arsenal would be missing out on a great opportunity to sign a top player to bolster their own squad. “If Martial doesn’t renew his contract at Man United, Arsenal would be crazy not to try and snap him up,” Lauren told Sporting Bet. The French international could certainly bring a different dynamic for the Gunners, offering genuine width and pace down the flanks to complement the likes of Mesut Ozil and Henrikh Mkhitaryan who prefer more central creative roles. With that in mind, Lauren makes a good point. However, it’s difficult to see United falling into a situation in which they are forced to give up Martial for nothing next summer. In turn, whether it’s an exit in January if he doesn’t form part of Mourinho’s plans or a hefty price-tag after renewing his deal, Arsenal will surely have to spend big to prise him away from Old Trafford as it’s unlikely that he’ll be allowed to walk free next summer. As noted by The Guardian, United have an option to extend his deal for another year, and that could be the short-term solution for them.